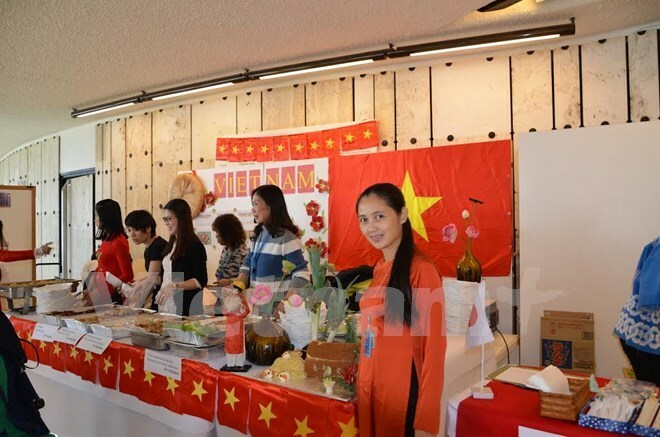 Geneva (VNA) - Vietnam’s traditional culinary arts fascinated foreign friends at the International Bazaar held at the UN Headquarters on November 24 to raise funds for disadvantaged children around the world. The event, held by the UN Women’s Guild (UNWG) in Geneva, the Permanent Missions accredited to the UN, Geneva government authorities and businesses, drew the participation of 60 foreign diplomatic offices and international organisations. According to UNWG President Christine Evequoz, the bazaar has become a premier event in the international community. She highlighted that the event featured international fine arts, craft and food stalls selling wares and a lottery with over 200 prizes to be won. In addition to excellent cuisine from around the world, visitors had a chance to enjoy a joyful atmosphere brought about by talented dancers, singers and music bands.